THE news that Portia was selling Portia’s Place after 25 years came as a shock with rumours rife the famous Chinese restaurant in Kingston would close within months of the June announcement. But almost six months later the restaurant’s doors remain open and there’s a good reason why – the new owner is the chef! Kun Chen has been head chef at Portia’s Place for more than a decade creating the dishes that have made the award-winning restaurant so famous. He took ownership on July 1 with his business partner Jessica Huynh. The pair is keen to let everyone know they’re here to stay. Portia’s Place is as famous for its political clientele as it is for its crispy duck pancakes and Shangtung Lamb. Regulars include Liberal MP Joe Hockey, Federal Opposition Leader Tony Abbott and former Labor leader Kim Beazley. THERE’S been a lot of talk about the new bar that’s set to open in Manuka soon. Construction continues at the old Verve site on the corner of Franklin Street and Flinders Way. “CC” can confirm Frank Condi is just one of the Canberra-based businessmen in a consortium involved with the new venture. And after bumping into him during the week, he’s told “CC” they’re very close to opening. And while Condi wouldn’t make public the bar’s name, when pressed, he did reveal a little inside information. But those keen to be part of the grand opening celebrations will be left disappointed. Word is there won’t be any. “We’ll just be open one day,” Condi says. 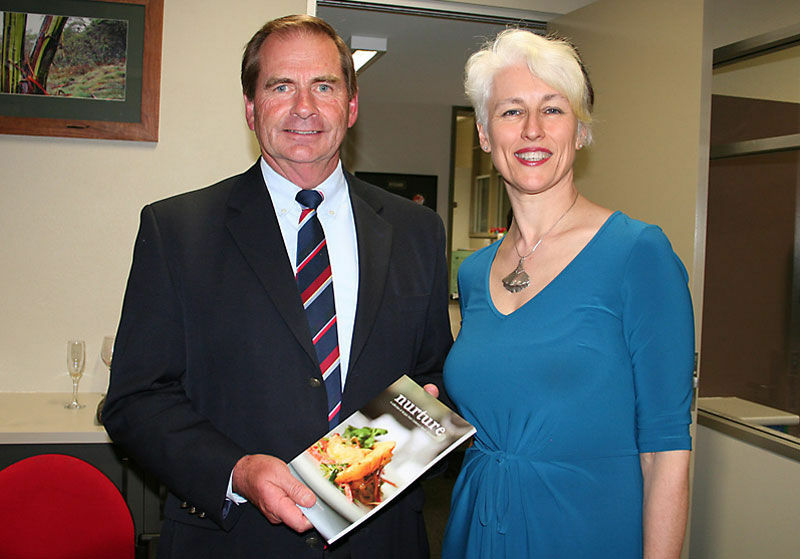 Queanbeyan mayor Tim Overall and Genevieve Jacobs at the cookbook launch. 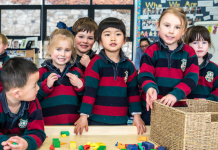 THE ABC’s Genevieve Jacobs has talked openly about experiencing the loss of a child. 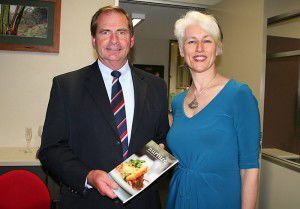 The afternoon’s presenter was officially launching the SIDS and Kids ACT “Nurture” cookbook when she revealed her reason for accepting the invitation to take part. Jacobs, who is the new ACT patron of SIDS and Kids, spoke about the emotional pain she experienced losing her daughter at 18 weeks gestation. “That New Year’s Eve, when the rest of the world was out celebrating, I was instead in labour at Calvary Hospital in Wagga,” she says. Jacobs told “CC” she’s been impressed to hear about the extent and depth of support that SIDS and Kids offers everyone who is affected by the loss of a baby or small child. And she believes the “Nurture” cookbook is a perfect way to raise funds for the cause. “What better way to mark that journey than with food which gathers us all together… over the dinner table… we hear other people’s stories and our own burdens are lightened?” Jacobs says. The SIDS and kids cookbook contains recipes from leading chefs and restaurants in the Canberra region and makes the perfect Christmas gift. Call the office for details 6287 4255. The author is a board member of SIDS and Kids ACT. CALLING on all Canberra ladies… how does an evening with a few hunky firefighters sound? That’s exactly what’s on the menu for the launch of the 2012 ACT Firefighters calendar at the Dickson Tradies, Monday, December 5. And we’re all invited! Tickets are $45 and include dinner and dessert, a signed copy of the 2012 ACT Firefighters Calendar, entertainment by Special K and a chance to meet some of the calendar models. “CC” will be there on the night. So get a group of girlfriends together and book now. It’s all for a good cause with all proceeds going to the Neonatal Intensive Care Unit at the Canberra Hospital. Bookings are essential on 6162 5656. 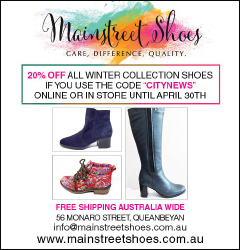 A NEW fashion label has been launched in Canberra. “It Is Isn’t It” is the brainchild of Gerard Wilton and his cousin Dana Samson. And the pair celebrated, with invited guests and designers, on a rooftop in Kingston recently. Apparently Zoo Advertising’s managing director Clinton Hutchinson gave the emerging designers access to the rooftop of the 59 Wentworth Avenue building. And the word is that he was very impressed with the launch and the clothes.